I would like to retrieve information on certain indicators, such as availability of systems, of more than one PRTG installation and show this data within one dashboard. How can summarize data of different sensors on different PRTG installations? How can I accumulate the data to show it on one map? When it comes to huge or several PRTG installations at one company (or as an MSP), it is helpful to display certain indicators of multiple devices or installations within one sensor or on a dashboard. With PRTG you can gather data of specific sensors either from the same installation or from several ones and show it within one sensor! The PRTG HTTP XML/REST Value sensor is able to retrieve and parse an XML file from a given URL. With the PRTG API you can craft such URLs and use them. You can then add the sensor to a map within the installation you have created it. Add a new HTTP XML/REST Value sensor to a device in your PRTG installation (for example, to the Probe Device). Adjust the Basic Sensor Settings to your needs. For example, enter a meaningful sensor name, especially if you use multiple HTTP XML/Rest Value sensors in your installation. The URL field in the sensor settings is where you have to enter the API request to retrieve the needed data from a PRTG installation. The following picture shows how you can create the URL for your API request. The following steps show you how to create such an API request in detail. To prepare the URL you need a text editor and access to the API of your PRTG installation. Access your PRTG installation via the web interface, copy the server name, including http(s)://, and add the name to the text editor. In the PRTG manual, go to Live Data. Add the desired API function (here: table.xml) after server name in your editor. You can find all data table parameters here. In this use case, the parameters content=sensor and columns=sensor,status are necessary. Insert the data table parameters after the API function in your editor. To get the required information, you need to further filter the data to retrieve. For example, filter by name tag to receive data of the desired sensors. You can find advanced filters here. Insert your advanced filter after the data table parameters in your editor. To access the data of a PRTG installation via the HTTP XML/REST Value sensor, the request does need an authentication, the credentials of a PRTG user account with sufficient rights. Passhash: You can find your passhash under PRTG | Setup | My Account, section User Account. Click Show Passhash to display it. Copy the hash and insert it after passhash= in your editor. Insert your authentication after the advanced filter in your editor. Enter the XML node. This determines the sensor value. In this use case it is sensor. 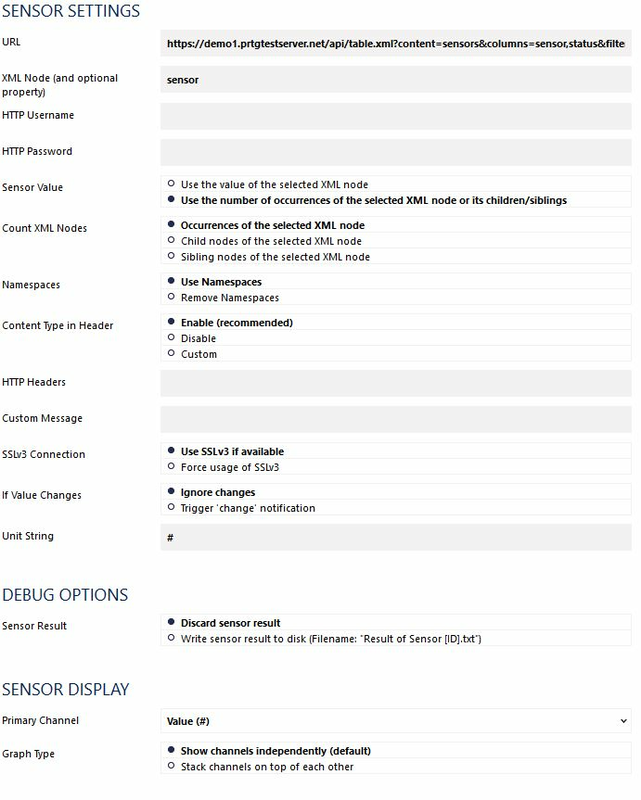 For the setting Sensor Value choose the option Use the number of occurrences of the selected XML node or its children/siblings to return the sensor count depending on your filter. Check your sensor settings according to the screenshot below. After saving all settings, the sensor will appear in your installation on the device you have added it. Now you can also add this sensor to a map! Note: Add limits to the sensor channel settings to receive notifications based on your defined thresholds (for example, if 5 Ping sensors are in down status).